A few days back i decided to give Mozilla Thunderbird a try, i have multiple email accounts and it is really irritating to log in and log out again and again to access different email accounts. I downloaded Thunderbird for Windows a free email client from Mozilla to manage your multiple email account easily in Windows. When i tried to log in to my gmail account i saw following error message. Even though my password or user name was not wrong. I received an email from We recently blocked a sign-in attempt to your Google Account. I have enabled Google’s 2 set verification for my accounts. Google’s 2 set verification helps you make your account secure. You can activate SMS or Call alerts for security. If enabled whenever you or someone will try to log in to your account from a new device, app or PC. You will receive a Verification code via SMS or Call. You will have to enter received Verification code to open access your account, other wise Google won’t allow you to log in. But if you will try to access your email account via Thunderbird, you will not receive any verification code via SMS or call. You will have to create an App Specific Password. 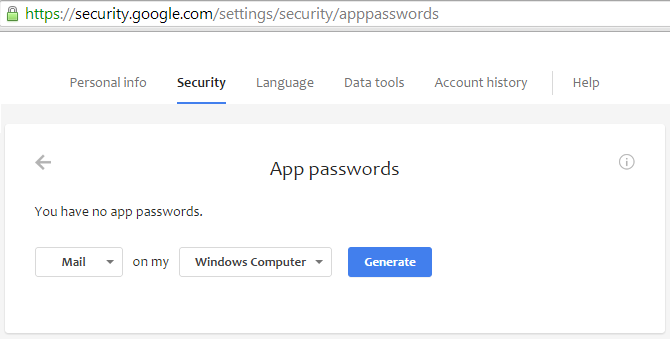 Visit https://security.google.com/settings/security/apppasswords to generate App specific password. A new small pop up Window will appear with password. Now type this app password in Mozilla Thunderbird and click Done. Everything should work great. remember you will have to type new App specific password in Thunderbird not your default password, you use to access your Google account. That’s all you have to do to solve invalid password or user name Thunderbird Gmail. Hope this will help you as well.